Oil and Water (or What Happens in Church Does Not Stay In Church). The oil clings to everything. It is an intrusion; it follows me home, persists, demands decisions. To be rid of it, scrub the skin. But I do not want to be rid of it; it recalls too many things hallowed. I am not ready to reach up to my forehead and, with one simple swab, remove it. It has already begun its migration. I’ve touched my face, hugged myself tightly, brushed my fingertips along my daughter’s hair. The oil is omnipresent. I’ve inhaled this before, as it wafted up from a street vendor’s table, usurping the stalks of Black Love incense and the low-end imitations high-end fragrances. I have seen it in a twist-top vial, its name hastily scrawled and Scotch-taped to the front. Frankincense, it reads, or maybe myrrh. In the car, we are three women leaving a service of confirmation: grandmother and mother and child. The windows are rolled against the cool night air, and the fragrance rushes ’round floor and ceiling. It occurs to me then that, like so many things at churches, the oil is decidedly masculine. I am thinking over what was said, deciding whether I feel betrayed, wondering if everyone’s looks of concern afterward meant that, now, they see me as a danger to myself. They would not be entirely wrong. Scent is an association. We are our associations. The last man I dated smelled of deodorant and fabric softener, which means, for better or worse, I pine for him as often as I pass any clean man in freshly laundered clothes. Before him: a man whose scent recalled potting soil; for eight years, I tried to plant sustainable things. I do not remember the smell of the preceding man — perhaps line kitchen and bar soap; I was rarely with him and, at the six-month-mark, eager to leave. And my first boyfriend, the 24-year-old I dated at 18, always smelled of an oil, something airy, almost unisex, rarely overpowering. My father smells of aftershave and cologne with aggressive top notes. What he wears is not oil- but alcohol-based. It absorbs, burns off, rarely lingers. The five of us who had taken adult bible class for three weeks stand gathered ’round the altar when called. Our regional bishop, having traveled from the Midwest for this purpose, is seated, a pillow at his feet. This is where we are to kneel when it is time. He takes the three on the left first; they are being received, not confirmed. They are already of this denomination and now they are joining this parish. They, like 98 percent of our small congregation, are white. My mother and I are aloft, on the other side of the aisle. In our 30 years of churchgoing, we have never been part of a denomination. I am here because I like the liturgy. I am here for the parts of this I can comprehend — and also for the marvels we are happy to leave unexplained. There are four priests in front of us, standing at the seated bishop’s right. On his left is our pastor. He has instructed the four to impart “a word” to each of us, if they feel led. The three people being received kneel when called, and the bishop presses a cross of oil onto their heads. He tells them about their lives: you are hurting; you have a gentle spirit; you’ve overcome something insurmountable; you are going to serve faithfully here. He has lifted a veil on their futures, glimpsed in, and backed away. They are discreetly weeping, but mostly composed. Prophecy makes me uncomfortable. It has since I was nine and a young visiting minister stopped mid-sermon to ask what I wanted to be when I grew up. I told him: an author, and he told he several things: that I would not be like other children, that I would write many books, that I would never have a day of lack. It was recorded and I kept the cassette till college. I do not like predictions; they apply an uncomfortable pressure. I am 33, unpublished, and I often feel invisible, the very definition of ordinary, even as I know I am not. Also, I have not been behaving. If obedience is better than sacrifice, my life is often a landscape of lack. I have tried out autonomy, doing as I wish, loving who I want, in whichever ways seem right. I have not followed the letter of the law. So I know what’s coming. In the churches of my youth, prophecy began with “I hear the Lord saying,” and ended with any number of messages, though the most memorable were “rebukes.” No one wanted to be rebuked; it meant someone would have to “pray a spirit off” of you — and there were spirits for everything. Spirit of poverty, spirit of promiscuity, spirit of depression or rebellion. 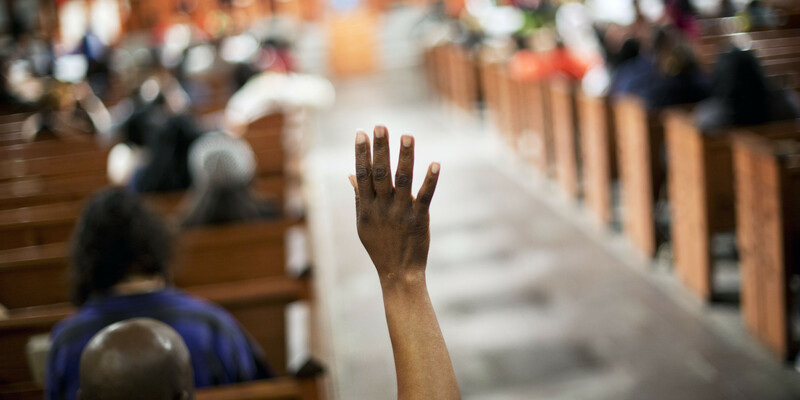 I had few greater fears while sitting in service than when a minister paced the aisles, pointing out congregants and calling them to stand or walk toward the pulpit for prophecy. This is, in many measurable, relief-filled ways, a different kind of church. But I know how I live. The blank after, “I hear the Lord saying…” could fill with flotsam fairly quickly. I kneel when it is time. The bishop rests his hands on mine, says that what he sees is compassion. This is not what I thought was coming: he says that I have a good heart. There is more, but I am crying and thinking and wondering where You are. I am wondering if even this can be trusted, when another priest jumps in to say I’ve been searching here and there for comfort — any kind of comfort. The comfort God gives will not leave you, he says. This is what I expected: to be told, in front of onlookers, that I have unresolved father issues, that I’ve become the classic looking-for-love-in-all-the-wrong-places cliché, that I need, in some fundamental way, to change. The priests are not wrong. Yet another chimes in and says that a wall I’ve built is breaking tonight. This, I have also heard in churches before. I have heard about my walls, everywhere, for all my life. I am no skeptic. But I do not like feeling so exposed. And I do not understand why anyone would want to be told by relative strangers, before a cloud of witnesses, what lies in the reddest, sorest recesses of her heart. The bishop says he feels led to embrace me and when he does, as all look on, I cry a bit harder into the folds of his crimson and ivory vestments. I am not sure why; I am exactly sure why. This has been my experience of faith: to remain ever uncertain and to be certainly present. In this way, I, myself, am the oil, meant to stain and to blur and to stay. Lord, You’ve been a long haul, and I’ve been resistant. Your burden has not felt light. To feel as weightless and unyoked as I should, I would need to more of what happens in church demystified. Prophecy has always made that difficult, itself an act that mystifies. You know better than most that I do not mean to be resistant. Were I a simpler woman, I would float along the water, or better, I would walk upon its surface. I’d let you bear me up. Were I uncomplicated, all the wounds that were reopened would be healed in the rushing current. Instead I am a slick, amorphous; I am moving in ways I can’t control. And yet again, I’m left asking You: can living water ever commingle with oil?